Over a number of weeks and months, John's life has been falling apart. His stressful work environment and wedding planning are only two of the pressures that have been twisting his insides and pulling at him. The Man Who Fell To Pieces explores John's physical and mental breakdown, as well as the mental ill health of those closest to him: his fiancé Caroline, mother Alice and the ever present household handyman Henry. Caroline and Alice stare into a bag sitting on the kitchen table. When John finally opened up and Caroline realised what John had been hiding from her, she picked up all his pieces off her living room floor and brought them to his mum's house where they are now sitting in a bag on the kitchen table. The women debate whether it would be better to send for an ambulance or a handyman to 'fix' John back together. I spoke to writer/director Patrick J O'Reilly last month for a preview piece written for Culture Northern Ireland. "He's telling the story of his depression, his breaking points and his way of dealing with depression by using his imagination. When he tried to vocalise his feelings, it was incoherent. How do you talk about depression without using clichés - like being 'sad' - and without it being less empathetic?" While John is a fictional character, the issue is a very personal one to O'Reilly. Over six months in 2012, he experienced a pervasive sense of low self-worth and hopelessness. For him, anti-depressant tablets were not a good fit for the context and circumstances behind his feelings, all of which feeds into the character of John in the play. One of the reasons O'Reilly attended the Jacques Lecoq International School of Theatre in Paris was to understand how to physically portray someone falling apart on stage. An opening title sequence humorously introduces the picture frame concept of physical detachment that will continue throughout the play. It also lays a bed of happiness in the souls of the audience which will take the edge of some of the sharper observations later on as John's road to breakdown is revisited. Alice is played by Maria Connolly and is a fast-talking, in-your-face mother who over the years has dealt with her own mood changes and frequent episodes of anxiety by calling for help. The yucky dark blue dressing gown that is normally wrapped around her sometimes opens up to reveal a little of a beautiful patchwork dress; but her moments of happiness never last very long. Roisin Gallagher at first plays fiancé Caroline as strong and stable, dealing calmly with the issue of her broken best friend. But through a series of flashbacks to key episodes in John's life over recent weeks, we see how her emotions and wellbeing have been affected by his growing depression. Being self-absorbed can blind us to other people's situations. In one of the final scenes, Gallagher silently displays a tenderness towards the brokenness of John that remains a moving memory the morning after the show, and makes this sentence hard to type given the mistiness of my eyes. Patrick Buchanan's tool belt-wearing Henry is a reminder that help is available. The character is not allowed to develop much empathy and Buchanan is often left spouting DIY facts and home improvement tips, one step removed from the real problem at hand. Henry is a warning that those we rely on may not fully understand what is going on our lives: misinterpretation can only be avoided by wiping away the stigma and being open and truthful about our feelings. Surrounded by a talented cast, Shaun Blaney tells John's story and reveals his pain and feelings through a very unique performance. His physicality - from his face through his limbs to his torso and his legs - brings to life the character of John as he is pulled apart and falls to pieces. It's remarkable to watch, and his deliberately hesitant monologues from the side of the stage guarantee the audience's empathy. The action all takes place inside the shell of a white-timber-framed house designed by Ciaran Bagnall. Nearly everything is cracked or about to falling apart, and the lack of solidity in the fixtures and fittings adds to the frailty of the piece. Katie Richardson's soundtrack supplies deep and unsettling noises before breaking out into song at key moments. The music isn't allowed to compete with the cast, but instead is like a fifth actor walking on stage: for example, "when love remains we carry all that we can save" from Nothing Is Going To Tear Us Apart. The simple yet sympathetic lyrics allow the four cast to act without words while the music tells parts of the story. As an audience member, you cannot ignore or step over The Man Who Fell To Pieces. It's a terrific and terrifying visceral insight into aspects of mental illness. Across the four characters you will see yourself and others you know and love. As a wake-up call and a conversation starter, it's an original piece of theatre from Tinderbox that uses emotions, props and music to tell a story that deserves to be seen and heard by a wide and varied audience. Every Day I Wake Up Hopeful (February 15 - March 1) and East Belfast Boy (February 16 - March 2). The Man Who Fell To Pieces plays at The MAC until Sunday 11 February and will then embark on a regional tour through The Alley, Strabane (Friday 16); Riverside, Coleraine (Tuesday 20); Cushendall Golf Club (Wednesday 21); The Craic Arts Centre, Dungannon (Thursday 22); and Down Arts Centre, Downpatrick (Friday 23). 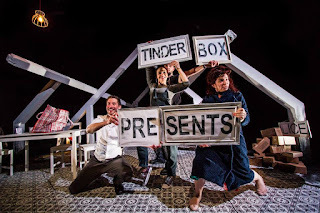 On top of the tour, Tinderbox's IN8 outreach programme will also take The Man Who Fell To Pieces into residential care homes, a prison and community centres, in order to reach groups of people who would not otherwise be able to attend theatre performances and explore these problems through creativity.